March 10 marks the 11th annual World Kidney Day (WKD). This is a day to reflect on the incredible job our kidneys play in keeping us healthy. Ball up your fist and that is roughly the size of your kidneys, and they are tucked neatly under your rib cage. Their health is affected by the lifestyle choices we make, by aging and other factors. 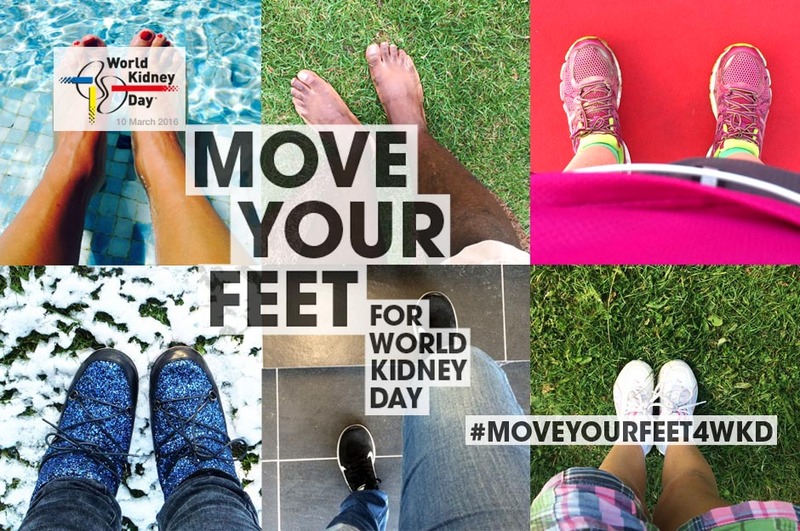 On World Kidney Day, people around the world are encouraged to ‘Move Your Feet’ as a symbolic gesture to remember that kidneys are vital organs that need to be taken care of. Moving your feet, that is doing something active, like walking, running, swimming, etc, is a way to increase our consciousness of our lifestyle choices and the risks and dangers of kidney disease and how to prevent it. Chronic kidney disease can sneak up and surprise many people because we can lose up to 90% of our kidney function before we experience any symptoms, such as fatigue, swelling, difficulty concentrating, decreased appetite, blood in the urine and foamy urine. Kidney disease affects quality of life. Trust me, I know. In 2011, my husband was diagnosed with chronic kidney disease. We had applied for life insurance and the results of the requisite blood test pulled the rug right out from underneath us: IGA Nephropathy, aka the tiniest filters in the kidney, called glomeruli, were damaged and no longer functioning. Three months later, he was told he had less than 15% kidney function and needed to go on dialysis immediately. Dialysis was a 12-hour per week commitment. Strapped to a machine that cleans your blood three times a week for four hours. It’s not what we called a fun Friday night! In between dialysis treatments, my husband would experience weight gain from water retention, a foggy head and headaches from toxin buildup in his blood, and have very low energy levels. I won’t even get into the terrible dietary restrictions of a kidney disease patient! 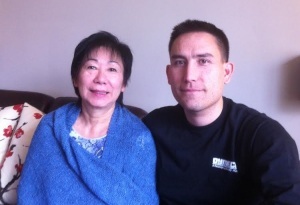 My husband and I were incredibly blessed that my husband’s mother was a match and generously donated her kidney. Both are doing very well two and half years after the transplant. We all hope his new kidney will continue to function for beyond the next ten years. 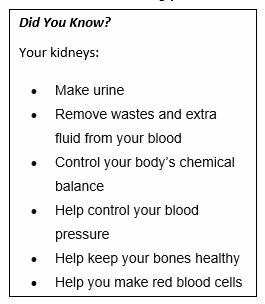 How can you reduce your risk of developing kidney disease? – Keeping fit and active. With regard to keeping fit and active, we invite you to join us at the 6th annual Alive to Strive Race on April 24 at the Terry Fox Athletic Facility and Hog’s Back Park. The Alive to Strive Race is the primary fundraiser for Alive to Strive Kidney Fitness Project’s Active Living Grant Program. Dialysis patients often lead sedentary and isolated lives as they spend long hours connected to a dialysis machine. Alive to Strive’s grant program helps to get chronic kidney patients active while connecting with other kidney patients. The grants have also helped individuals qualify for a transplant by reaching a healthy weight. To date, over 130 grants have been awarded and have had a huge impact on recipients’ lives. The Alive to Strive Race offers a 1km, 5km, and 10km. There is also a 5km Team Challenge – grab four to 10 of your family members, friends and colleagues, and put a team together! 100% of your race fee goes directly to supporting the fitness grants. Race details and registration are available at this link. Come ‘move your feet’ on April 24th for kidney health!